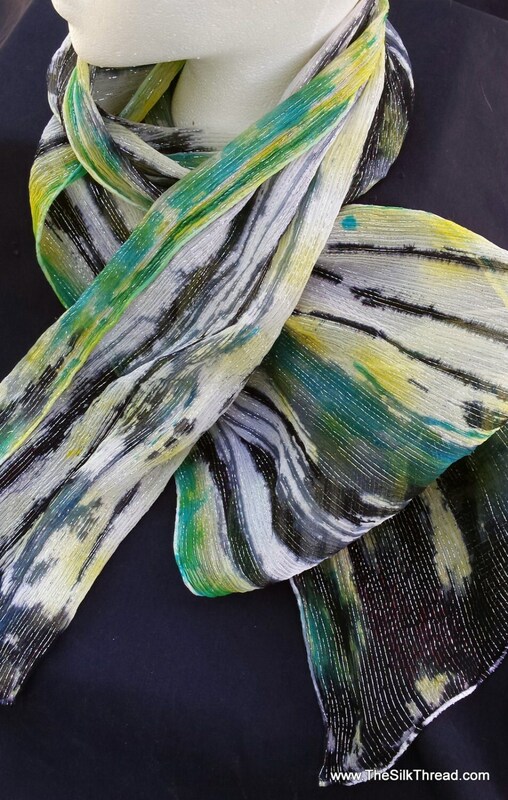 A unique hand painted 100% Silk scarf with abstract patterns in shades of black, yellows and greens. The scarf is infused with long silver threads that add beautiful silver highlights and sparkle to the 10" x 60" length. It would complement anything from casual to dressy! In all my silk pieces, I either design and carve my own blocks to print my designs or hand draw all my designs onto the silk. The results are classic designs, beautiful colors and a one of a kind silk scarf. This piece has a lovely texture. Each piece is hand painted and dyed by artist M Theresa Brown. here in my North Carolina studio! No commercial factories. Hand wash in cool water drip dry. Iron as needed.